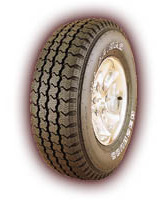 Offering a wider tread footprint than our previously designed LT radials, this all-terrain tire is designed to wear evenly when run at recommended inflation pressures and loads. Belt edges are supported by specially-designed sidewall wedges. Steel cords help shield the tread area against penetration and impact breaks. The strength of steel and an optimized tread radius provide a big, flat treadprint for total road contact and stability.